If this is your first papier mache project, I recommend blowing up a balloon and using the inflated balloon as a support. For those that have some experience, I suggest creating the mask shape in plasticine clay. When working with plasticine, be sure to allow a little extra depth when sculpting as not to lose detail as the papier mache will be applied on top of this mold. 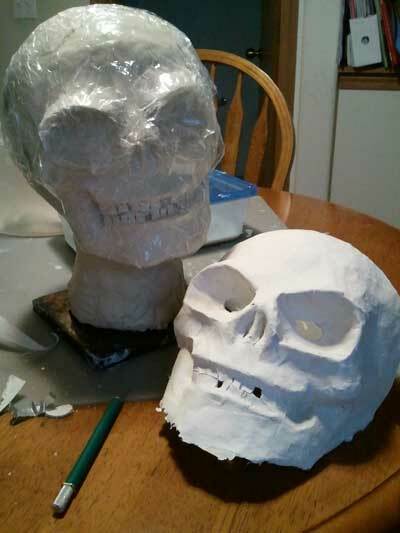 In the first photo is a clay mold covered with plastic wrap (to keep mache paste from sticking to the clay - also helps speed drying time) that I used to create a skelton mask for my son Sam's halloween costume. Once the plastic wrap is placed on the plasticine mold, tear newspaper into strips approximately 1" x 6". For areas with fine detail, you may want to use smaller pieces. It is important that the strips are torn and not cut with scissors for the fibers to bond. After newspaper is torn, prepare the mache paste (see below). Paste can be refrigerated for 1-3 days if needed. Mix and add water if needed. Consistency should be like apple sauce. Take one strip and dip into the paste. Using finger and thumb, run strip through and remove excess paste then apply to mold (or balloon). Apply next strip but change the direction so that it still overlaps but in a perpendicular direction (like hatchmarks). After the entire surface is covered, 2-3 layers thick, let dry 1-2 days. Add another 2-3 layers or till desired thickness is acheived. Dry completely. 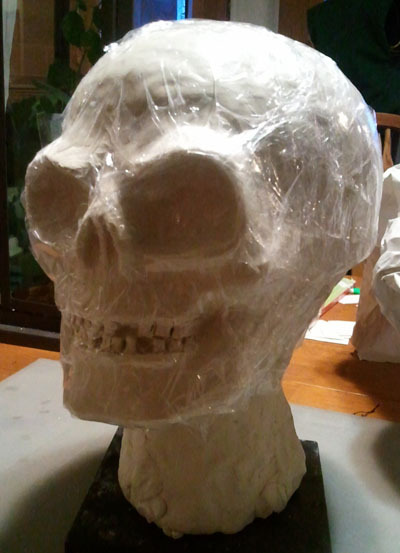 To remove the papier mache from the mold (for plasticine. If using balloon, simply pop the balloon), you may need to cut away part of the mache and then reattach it. For instance, for the skeleton as the mask covers the face as well as the back of the head, I used an exacto knife and cut along the temple across the top of the skull to the other side and then removed the front and back piece (see photo #2). If mache needed to be cut from the mold, attach front and back together using more mache strips as used in original construction. Trim rough edges and then apply 1-2 coats of gesso (http://www.amazon.com/s/ref=nb_sb_noss_1/180-8747087-3669869?url=search-alias%3Daps&field-keywords=gesso or www.dickblick.com). Let dry a few hours and then decorate using your favorite paints, fabrics, feathers, etc. 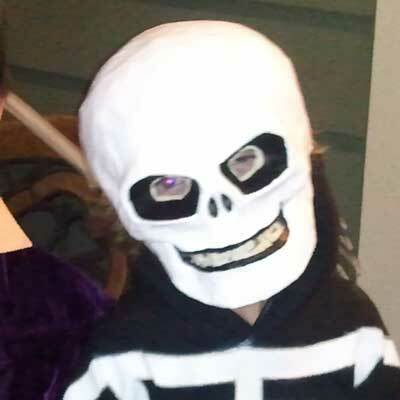 For the skeleton mask, I used acrylic paint with glow powder mixed in with acrylic gloss medium for detail line work around the eye sockets and mouth/teeth. 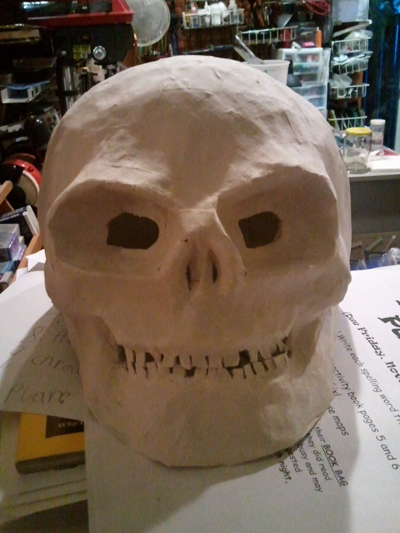 Additional papier mache projects (masks/theater props) can be seen on my website here. I've always kept a sketchbook - even as a child I was never far from a pad of paper. Today, I still carry a little black blank journal with me at all times. You never know when inspiration will strike..well, that and also the need to jot reminders to self like picking up milk at the store and to note a friend's book/movie/restaurant recommendation before I forget it. My intention of this blog is to not only have an electronic version of a sketchbook to share with others (minus the grocery shopping lists) but also to note work of other artists (and possibly interviews) or things I find of interest. You may find anything from a quick sketch and resulting final piece to a fantastic new recipe.